Zone3 has announced the beginning of a long-term partnership with British triathlon star, Tim Don. A household name in both UK and worldwide triathlon circles, Tim Don has a career spanning over two decades, racing across both the ITU scene and long-distance events at the highest level. Career highlights include being a 3x Olympian and 4x ITU World Champion, as well as the accolade of holding the current IRONMAN World Record (in a time of 7:40:23), which he won at the South American Championship in May 2017. At the IRONMAN World Championship in 2017, Tim was a favourite for podium contention, before a serious collision with a car during race week led to a fractured C2 vertebrae. With all eyes set on his comeback season at Kona 2018, Tim will race in Zone3’s high performance wetsuits and swimwear. 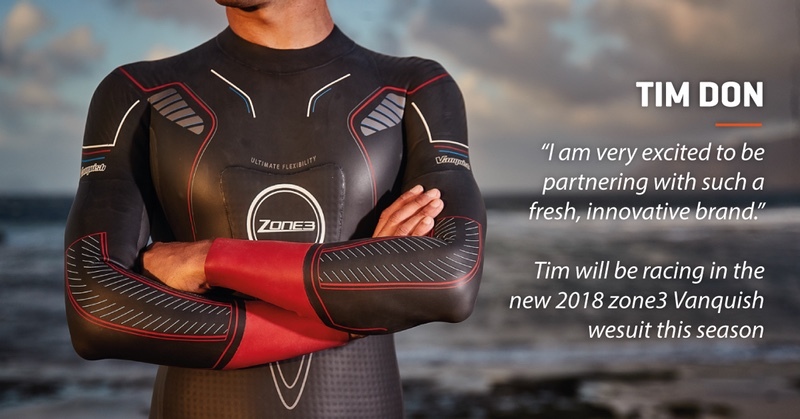 From being in a ‘Halo’ neck brace through his first swim using a snorkel and on to front pack swims in IRONMAN races worldwide, ‘Zone3 will support Tim every step of the way’. Zone3 swim accessories will also play a large part in Tim’s return to form. On the new partnership, Tim Don said “I am very excited to be partnering with such a fresh, innovative brand. Watching Zone3 grow from small roots in Loughborough UK to becoming one of the leading wetsuit and swim skin brands in the global marketplace today has been cool. To be a part of the team with other amazing athletes and working as an integral part of their development team is great.